Newcastle United At The Crossroads – Which Way? So here we are, gladdened by escaping the clutches of relegation by narrowly beating the worst team in the league. Here we are at a crossroads for the short-term future and ambitions for the club. There is nothing we can do about it now, it’s gone. Lessons need to be learned, questions must be answered. The season highlights DVD is set to be arrowing it’s way to a bargain bin near you! What kind of massochist would want to sit and review 18 defeats? In fact some of the content from recent weeks could make it a cult X-rated horror for those who like to scare themselves. Not for me, I would rather nail my hands to a sinking ship. I am consigning this season to the dustbin. After all that’s where it belongs as it has been absolute garbage. Don’t get me wrong, there have been some highlights – like the European adventure – but very few others. Which poses the REAL questions. Will the club invest significant funds in improving a squad that is not strong enough? What are the ambitions of the club and owner? Is the current playing squad good enough for Newcastle United? Is the current Management and Scouting strategy correct for Newcastle United? I hope from the bottom of my heart that the club will learn a huge lesson from the ridiculous stalemate in the transfer market last summer. We know that there is extra money from TV revenue, and without doubt we desperately need to strengthen what I see as an unbalanced squad. A smattering of British talent would not go amiss either, though I am not against the foreign/French lads in any way (as long as they are good enough). The ambitions of the club and owner will be found out by the movements in the transfer market. If we buy a Bigirimana and an Amilitano, as opposed to top quality players who can affect the first XI, then you have your answer. Unfortunately, we may have to wait for a Chronicle special where Llambias waffles about Purple players and such tripe, to even get a sniff of what’s going in their heads. The big Boss certainly isn’t going to say a dickie bird. The current squad obviously is not good enough. To be beaten 18 times and ship 67 goals is bloody awful. I would say we have some good players, but some that can count themselves fortunate to still be anywhere near the black and white shirt. People will point at Pardew, his tactics and team selections, but you just can’t put it all down to a manager. The first team is not balanced and that needs to be addressed. Two strikers of quality need to come in (no more Shola on 70 minutes), two wingers who can actually cross balls from the by line would be nice, a creative central midfield player capable of getting half a dozen to ten goals (Lampard anybody? ), a commanding centre half to replace Colo if he leaves and a left back. But its easy sitting here saying it, it’s another doing it. I also see a few players agitating for a move. They will not have enjoyed the season and the flak that has come their way and will no doubt have their agents looking for a route out. If so, tatty bye and shut your door on the way oot. The manager has to take the ultimate responsibility for what happens at Newcastle United, after an incredible first full season where the goals flew in and the clean sheets were bountiful – the flipside has came in full force this. There have been numerous and lengthy injuries to key players (and partnerships), suspensions at bad times – but these happen at every club. However, we really have been crippled this season with the extra games on top of the injury list. We all knew in the summer the squad was not big enough. 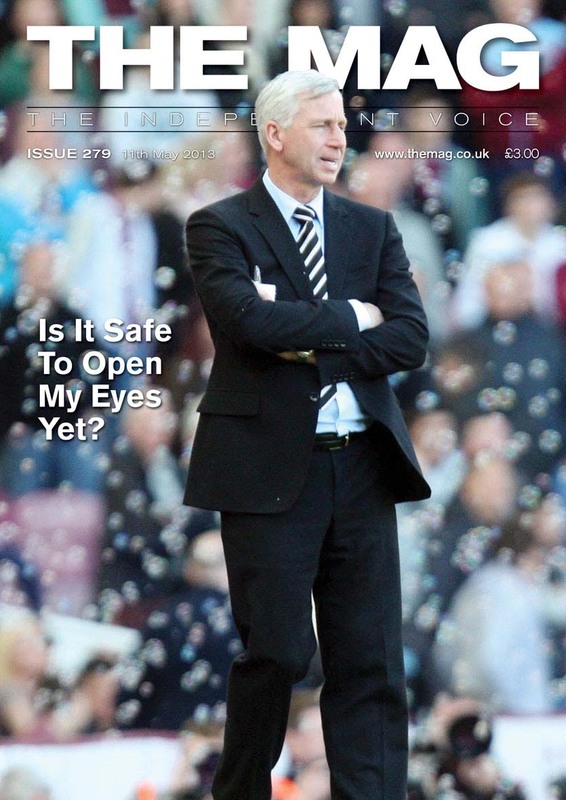 We have all been pretty hacked off recently with the way it has gone, and a lot of good supporters have been calling for Pardew to be sacked. I do think though that he will be given another season – or at least until Christmas to prove that this was a blip. But on the other hand it would not surprise me one iota if the axe fell on Pards. We really have reached a point where you could not really argue a strong case either way. Who would come in and work under the current regime’s restrictions is another matter. If they have decided Alan is no longer the man for the job – they need to act swiftly and decisively (not a word you would associate with NUFC’s hierarchy) a successor would have to be brought in asap and allow them to spend the funds to improve on players they want. The much lauded scouting system is under scrutiny. I am personally not a huge believer in it. Mike Ashley, like the great colonialists, scouring the globe for hidden treasures, but only willing to trade in cheap trainers and bags of salt. You get what you pay for sometimes. Unsettling players, who then agitate for the move, means you get more player for your money – but for me it also means you are getting a player with a flawed character. We now have a team full of these players, foreign trinkets to be polished up for resale. Now before I get shot down, there have been some real successes, but as they say variety is the spice of life and really I would like to see a team blended of quality British players, studded with quality foreign imports full of both youth and experience. We seem hell bent on sticking to one plan and that can, and possibly will, leave us heading down a ‘Cul de sac’. Where do we go from here? I am tempted to say who the bloody hell knows but what I think means sweet Fanny Adams. It’s over to the club now and a summer that looks set to be very interesting in the short-term future of our beloved Newcastle United. In the very short-term we have our final home game of the season against Arsenal who stuck seven past us at the Emirates. Unlike our gaffer, I do care if we lose 0-4. If we win we could even finish tenth – how bizarre. Though that would not paper over the cracks would it? You would need a hell of a lot of wallpaper. New issue of our magazine on sale in all Tyneside newsagents, or order now online for only £3 (plus postage) for Worldwide delivery straight to your door, or why not start a subscription – prices from only £23.